Long Shot Could Play Spoiler Role In Kentucky Senate Race : It's All Politics If Democrat turned independent Ed Marksberry is able to capture even a small percentage of the anti-Mitch McConnell vote, that could spell trouble in a red state where Democrats have little room for error. 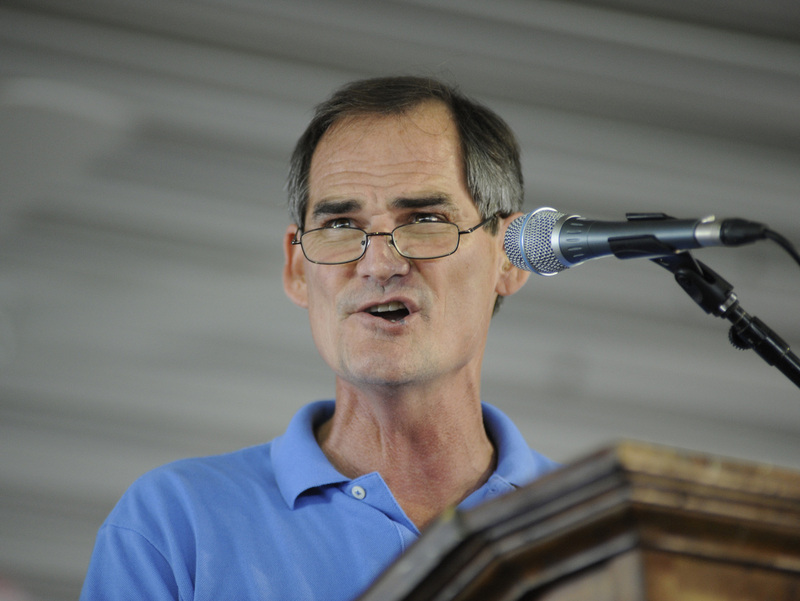 Kentucky Senate candidate Ed Marksberry, who's running as an independent, speaks during the 133rd Annual Fancy Farm Picnic in Fancy Farm, Ky., in August. Ed Marksberry is the longest of long shots against Kentucky GOP Sen. Mitch McConnell. While the unknown Democrat turned independent is given little chance of defeating the Senate minority leader, Marksberry could still play an important role in the 2014 race — as a spoiler candidate in a contest that many expect will be decided by a close margin. It's not McConnell who's most threatened by the third-party candidate. Rather, it's the all-but-certain Democratic nominee Alison Lundergan Grimes, who already had her work cut out for her prior to Marksberry's decision late last month to drop out of the Democratic primary to run as an independent. In a tight race, if Marksberry is able to capture even a small percentage of the anti-McConnell vote, that could spell trouble for Grimes in a red state where she has little room for error: Kentucky has not elected a Democratic senator since 1992. Marksberry, a building contractor who ran unsuccessfully for Congress as a Democrat in 2010, tells NPR one of the main reasons he decided to run as an independent was because he was disappointed with the direction of the party. He even sued the state Democratic Party in July, claiming it was violating its own bylaws by favoring Grimes over other candidates in the primary. "There is no voice for the progressive- or liberal-minded voters here," Marksberry says. He brushes off concerns that he could serve as a spoiler to Grimes, arguing it "would be shortsighted to try to get rid of McConnell at any cost." Marksberry does admit, though, that "the Grimes campaign is probably scratching their heads" over his decision. Matt Wyatt, a Kentucky-based Democratic operative, says he could see Marksberry potentially winning over some liberal voters who are disenchanted with Grimes, especially her more conservative stance on coal. But, he argues, that wing of the party is usually not active enough to make a major difference. "The vast majority of Democrats will stick with their best chance to upset Mitch McConnell," Wyatt says. Veteran Kentucky Democratic political consultant Jim Cauley says the Grimes campaign should be less concerned with Marksberry taking Democratic votes than the "middle vote" — those who may not be engaged in politics on a regular basis but don't view McConnell favorably. "I don't want to give them another place to go," says Cauley. "In that sense, a third party could make all the difference." In 2012, for example, Republicans contended that Libertarian candidate Dan Cox cost them a shot to take out incumbent Democratic Sen. Jon Tester in Montana. In Kentucky, a Reform Party candidate nearly tipped the balance in a 1998 Senate race by winning just over 1 percent in a contest that Republican incumbent Jim Bunning won by a razor-thin six-tenths of a percentage point. So far, the Democratic establishment has coalesced around Grimes and is committed to making the 2014 election McConnell's toughest campaign in decades. Both the McConnell and Grimes campaigns, along with a handful of outside groups, have already engaged in an aggressive advertising war with Election Day still more than a year away. Each candidate reported raising more than $2 million from the beginning of July through the end of September. But before McConnell can focus solely on the general election, he must also deal with a Tea Party challenge from Matt Bevin, who earned the endorsement of the influential Senate Conservatives Fund last week.